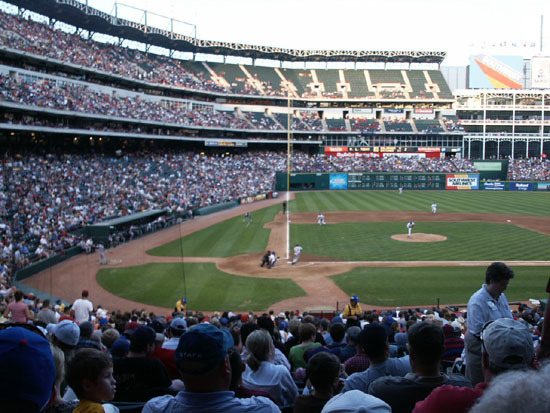 The Texas Rangers play at the Ballpark in Arlington, renamed the day we attended the game to Ameriquest Field in Arlington. 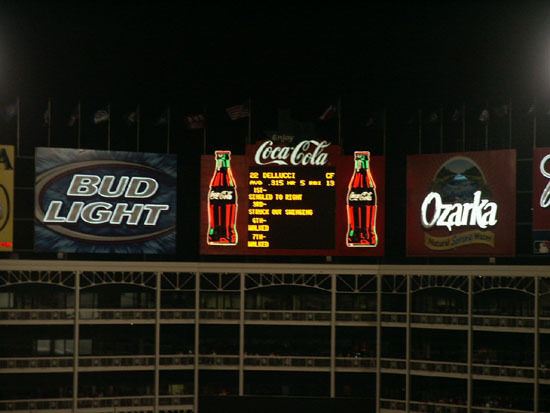 The average fan was not happy about the renaming which gained $75 million for 30 years. 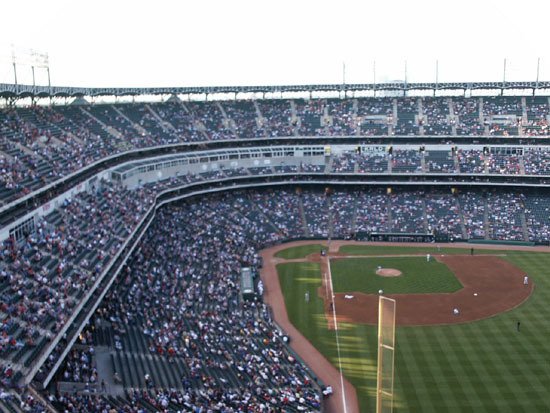 The ballpark built in 1994, seating 48,114, is very nice. 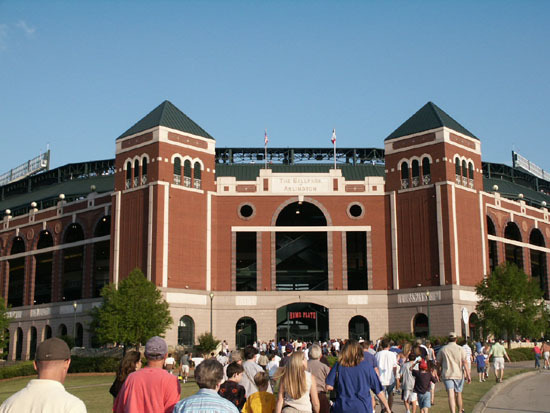 It has a brick exterior with large square towers at home plate and the baseline corners. 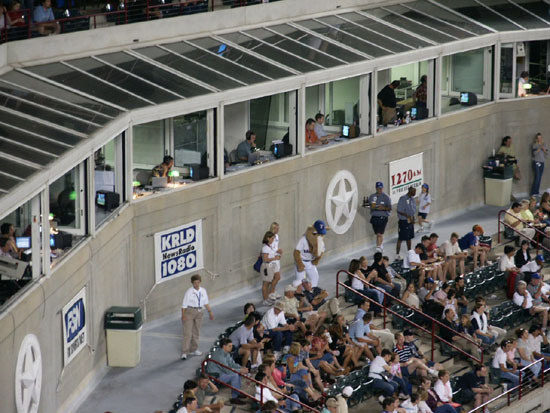 The interior is open and there is a unique covered area in left field called the Home Run Porch. 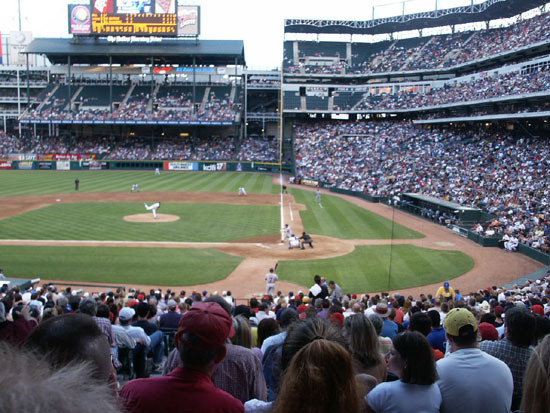 It is like the old ballparks in design. 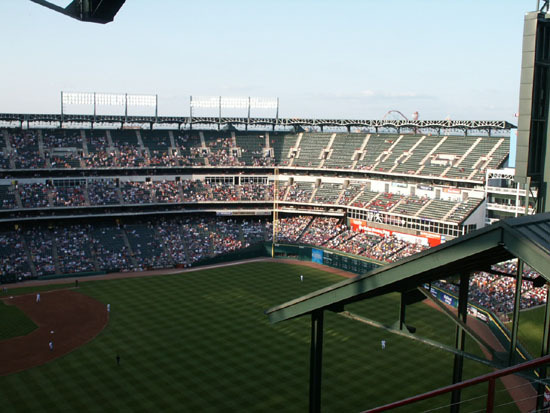 You cannot see the playing field from the 1st level concourse. The field is fully enclosed by the stadium. 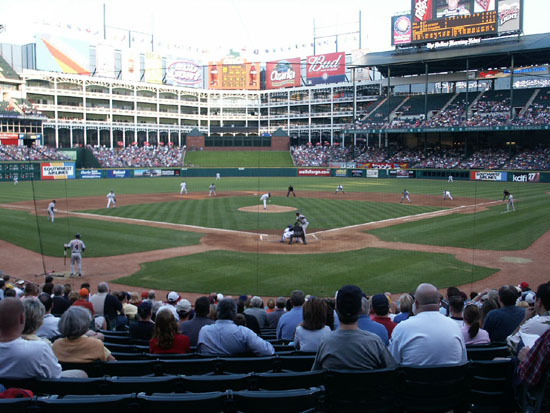 The Rangers were playing the Detroit Tigers. They made a try for a comeback win in the bottom of the 9th, but were unsuccessful. Detroit won 8-7. 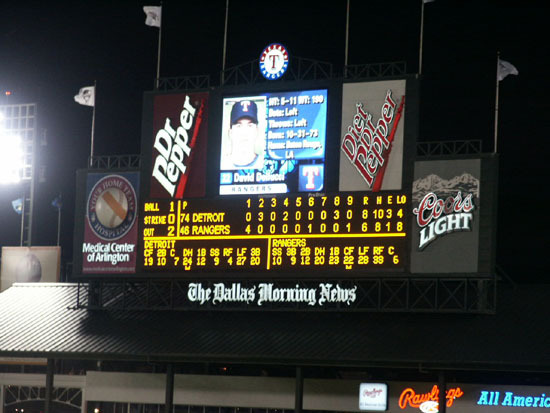 The box score was Detroit R-8, H-10, E-3, LO (left on)-4 and Texas R-7, H-9, E-1, LO-8. The field lines are RF-339-345, CF-404-400-407, LF-332-354. 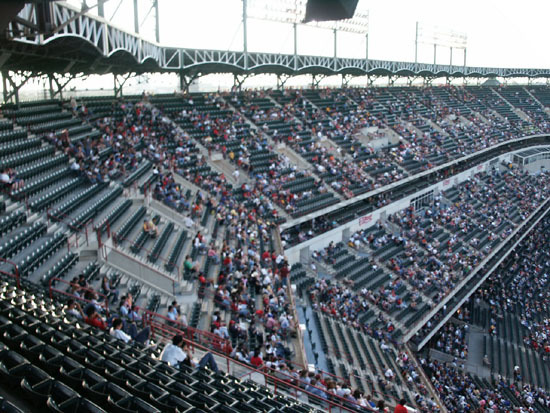 Pudge Rodriguez returned as a Tiger and received an ovation each time he was up to bat. 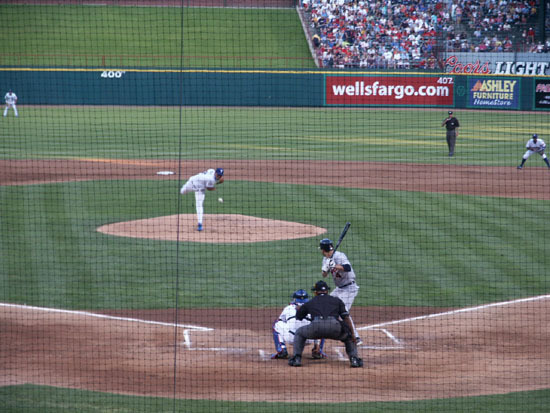 He is batting in the close-up picture down the 1st base line. 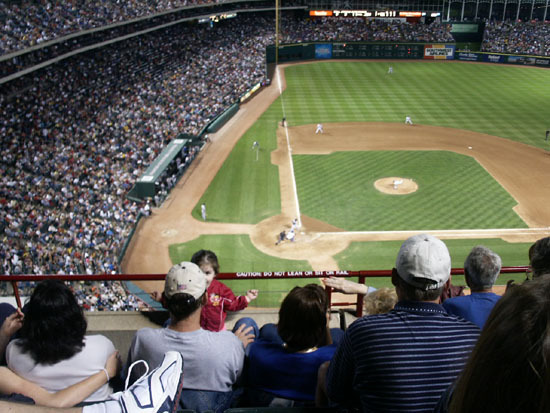 Attendance was 41,095 as the Rangers have the best record in baseball at the time of this game. 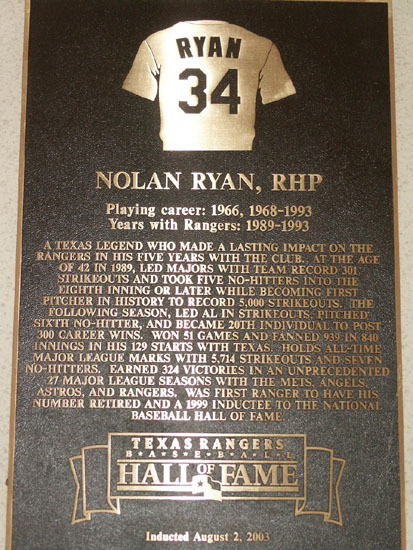 Around the inside of the first level outside wall there are plaques of the Ranger stars and special games. The mascot is a horse named Ranger's Captain. 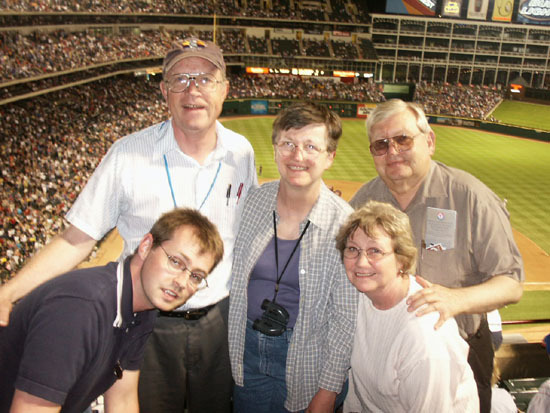 We went to the game with our daughter's fiance's parents Fred and Kay and fiance's brother Bradley. 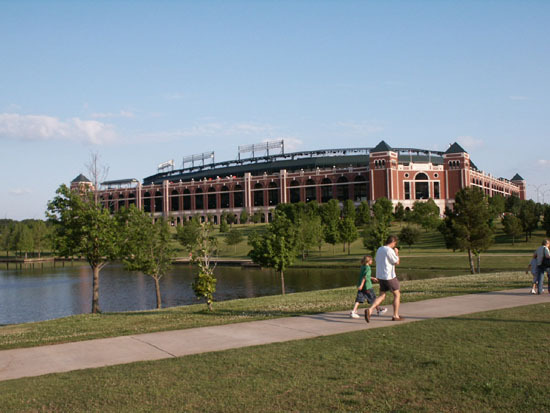 2014 stadium name if Globe Life Park in Arlington.